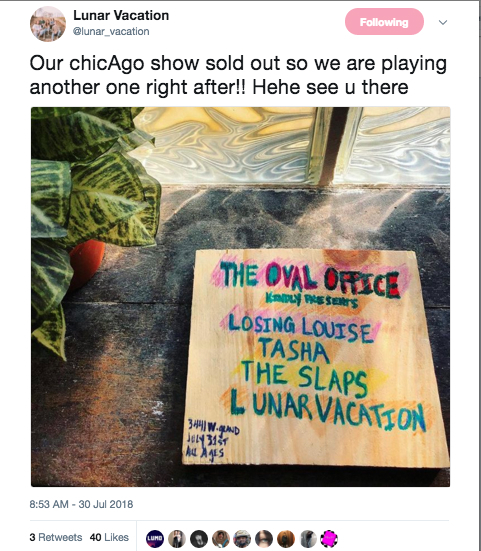 On August 31, Lunar Vacation played a second show at The Oval Office for Chicago fans when the Subterranean Downstairs show sold out. “The show sold out at a venue with a smaller capacity than we realized. Most of our friends weren't able to get tickets to that one. So we wanted to set up another show for more people to be able to see us” explained bass player John Michael Young. The band announced the second show on Twitter the day before- with the place and time scribbled with marker on a piece of scrap wood, in true Lunar-style. Even with only posting about the show last minute, though, the band managed to draw a crowd of 75-100 people. The impromptu show points to how quickly the band is growing, as well as how well they are maneuvering such growing success by doing everything they can to keep fans happy and involved. Review: Lunar Vacation Brings New Boldness in "Artificial Flavors"